OBESITY is an EPIDEMIC in America. The number #1 reason people eat unhealthy high-fat foods is that those foods taste great. If we can understand this motivation to eat high-fat food, then we can develop fatty taste substitutes that retain the flavor of fat without the calories. That would help reduce the prevalence of obesity and the serious health consequences that are associated with obesity. 1 the taste of fat ~ Our laboratory is providing evidence that the taste of high-fat foods may motivate us to eat more of these delicious yet unhealthy choices. 2 drugs affect taste ~ Furthermore, we are examining whether drugs that we take to reduce anxiety may contribute to the over-eating of tasty foods. Training TOMORROW'S SCIENTISTS is another major goal of my laboratory. Every year 3-8 undergraduate students gain hands-on experience conducting rigorous world-class research projects in my laboratory. In addition to technical laboratory skills, students develop logical, critical thinking skills and learn creative problem solving strategies while collecting, analyzing, and report the experimental data. 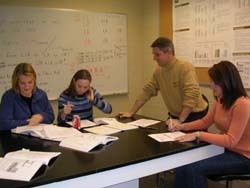 I am always looking for motivated and enthusiastic students to learn in my laboratory. Contact Dr. Pittman if you are interested!